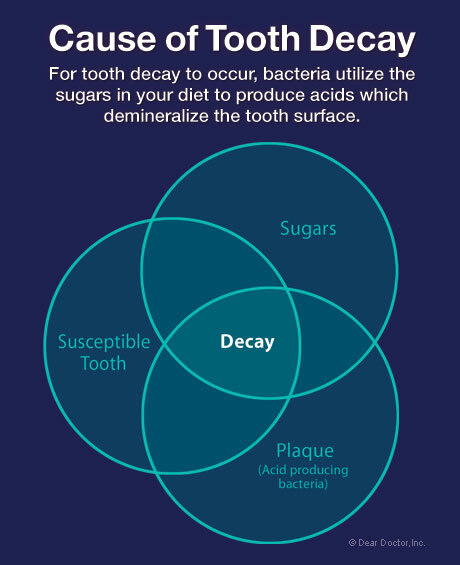 For tooth decay to occur, specific decay causing bacteria utilize sugars in the diet to produce acids, which demineralize the tooth surface — the first step in the formation of cavities. 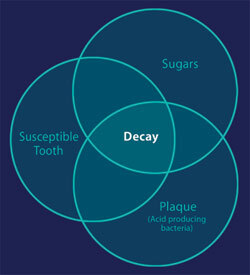 Sugars are the main culprit when it comes to dental decay. Bacteria in your mouth produce organic acids from dietary sugars that concentrate in dental plaque, the sticky whitish film that collects on surfaces of our teeth. When sugars are ingested, there is an increase in acidity, which causes dissolution of the enamel and dentin of the teeth leading to cavities. Our modern diet contains a mix of sugars and oral bacteria can ferment all of them with more or less equal ability, with the exception of lactose (milk sugar) from which less acid is produced. However, it is important to remember that there are many varieties of sugars and the form and frequency in which they are ingested impacts oral and general health. High Sugar/Low Fiber Diets: Refined or processed sugars are derived from two main sources: sugar cane or beets yield sucrose, the scientific name for what we know as sugar. The other big source is corn, which when processed yields high fructose corn syrup. Both these forms of sugar are devoid of nutrients. When added to our diets, they are referred to as "processed, added, or free sugars." As you’ll see, they turn up in cake, candy, cereals, cola, cookies, and a lot more. Large quantities of either sucrose or fructose in the diet are highly cariogenic (decay-causing) and also contribute to obesity. High Fiber/Low Sugar Diets: All plants produce simple sugars, known as "natural" sugars, the products of photosynthesis — sunlight acting on green leaves. Fruits and vegetables contain glucose, fructose, and sucrose, which are digested and/or absorbed slowly and more efficiently due to their fiber content. They also contain vitamins and minerals, which can only be properly absorbed in this form. Consuming more fresh fruits and vegetables instead of free sugars is likely to decrease decay and promote health. Starches constitute a very diverse food group, which vary in botanical origin. They may be highly refined and consumed in their natural state, raw, or cooked (peas, bananas, beans). Whole grains have properties that protect teeth. They require more chewing and thereby stimulate secretion of protective saliva. Cooked or uncooked staple starchy foods such as rice, potatoes and bread have low decay producing potential. When sugars are added to already starchy foods, the potential for decay increases significantly. Fruits do not play a significant role in dental decay unless consumed in excess. Dried fruit, on the other hand, may be more cariogenic due to a high sugars content and sticky nature. Some dried fruits contain sugars that are added during processing. Soft drinks, sodas, fruit juices, and sport drinks represent the single largest source of sugars consumption in the US. Data from the Centers for Disease Control and Prevention (CDC) cites that half of the US population consumes a sugars-sweetened beverage on any given day and on average, sugary drinks provide 103 and 178 calories per day for females and males respectively. Data from the National Health And Nutrition Examination Survey (NHANES) in the US shows that on average children obtain between 13-17%, and adults almost 12% of their calorie intake from added sugars (excluding free sugars from fruit juices), which exceeds the current World Health Organization (WHO) guidelines. WHO has made a strong recommendation that free sugars should not provide more than 10% of calorie intake and further suggested that limiting intake of free sugars to no more than 5% of calories (approximately 3 teaspoons for a child and 6 for an adult) would confer further health benefits. The fight against dental decay starts with effective oral hygiene practices, which include brushing and flossing. Other methods of tooth cleaning such as eating fibrous foods, apples, and carrots will not cleanse the tiny pits, fissures and contact areas of adjacent teeth where decay begins, but are healthier than eating sugary snacks that stick to the teeth providing reservoirs for acid production. Fluoride provides a vital topical protective effect. When fluoride is incorporated into tooth enamel, it makes it more resistant to acid dissolution and therefore decay. Brushing with fluoride toothpaste is the most important way of getting fluoride into the surfaces of teeth. Even in this modern fluoridated world, individuals with a high level of free sugar intake (>10% energy intake) and a high frequency of sugar consumption (>1-2 times per day) are at increased risk of decay. Xylitol, a natural plant "sugar alcohol," chemically similar to sugar has proven a useful adjunct in controlling tooth decay by replacing sugars and stopping acid production in bacteria. Scientific evidence attests to the fact that chewing xylitol-sweetened gum, mints, or candy (without sugars) stimulates saliva flow which helps protect against decay.